DiabloSport has created a new Reaper Stage 1 Kit which now includes the Trinity 2 Platinum Tuner. Reaper Stage 1 Kit is a performance combo that is designed to improve power, drivability, and mileage potential. Reaper Stage 1 Kits simplify the process of trying to pair performance products from multiple companies by adding all the components in one high performance package.The Reaper Stage 1 Kit pairs a high-efficiency intake with performance tuning designed to compensate for upgrades like aftermarket tires, gears and other accessories. Now you can take your ride to the next level and “reap” the benefits of this high performance package. Jammer Intake: Jammer Cold Air Intake serves as a performance part that can provide efficient filtration, cooler air charge, and great looks. The cooler air charge that the intake provides basically equates to more oxygen and more performance. 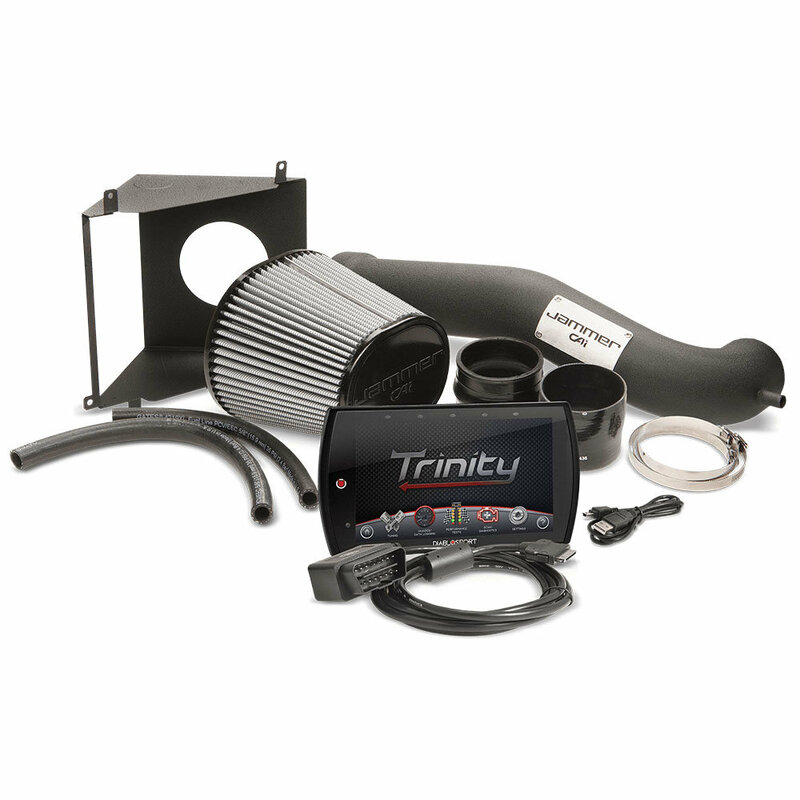 The pairing of the tune and intake combo is a great kit to help build power and supply cold, clean air to your engine. You will Get the most out of your tunes with a quality Jammer Intake on your Jeep. Trinity 2 EX Platinum Tuner: The Trinity 2 Tuner raises the bar by including an industry-leading digital display, high-definition graphics, high-speed and yet simple user interface, and of course, limitless potential of CMR custom tune options. The T2 Platinum Tuner is already equipped with some of the best tuning right out of the box and gives access to a nationwide network of CMR custom tuning dealers which can build tunes for your specific ride on a dyno or by using the built-in data logging features of the Trinity. With this you can have great tunes for now, and custom tunes for when you take your next off-road excursion.